The Bernese Mountain Dog is the best known of the Swiss mountain dogs and it can be readily distinguished from the other varieties by its coat, which is long and slightly wavy in appearance, without being curly. 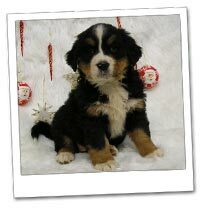 In terms of colorations and markings, the Bernese is identical to the mountain dogs. A white blaze on the head extending between the eyes and a white chest marking known as a cross, are essential characteristics. White paws, ideally extending no farther than the pastern are also preferred, as is a white tip to the tail. Bernese are affectionate and responsive dogs and make wonderful family pets if they have adequate exercise. Females range in size from 50-80 pounds and 21-25 inches high and males from 60-100 pounds and 24-28 inches. The Bernese Mountain Dog is very social and is extremely loyal to its family. The breed is eager to please and easy to train. Bernese are very gentle with children and generally good with other pets. 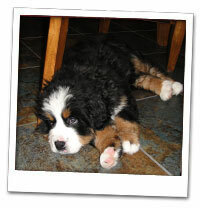 The Bernese Mountain Dog is perfect for anyone looking for that "gentle giant". Our Dam, Faith, is OFA Certified and Thyroid Certified.